Summary: In a futuristic world nearly destroyed by religious extremists, Justin March lives in exile after failing in his job as an investigator of religious groups and supernatural claims. But Justin is given a second chance when Mae Koskinen comes to bring him back to the Republic of United North America (RUNA). Raised in an aristocratic caste, Mae is now a member of the military’s most elite and terrifying tier, a soldier with enhanced reflexes and skills. I picked up this book last year when it was released, as a Richelle Mead fan I tend to pick up all her books since discovering “Vampire Academy” so, naturally the “Age of X” series was a no-brainer for me especially with the mythology elements. So lets see, the world, having been ravages by genetic disease has been split up and muddled, with RUNA – a government, controlling the majority of North America being the first “Nation” to overcome the diseases and become the world’s “jewel”. In combating these genetic diseases, citizens were encouraged to inter-breed with other nations in a bid to mix their genes. So this book is told from a couple different perspectives; Justin, an exile living in Panama where he is contacted by his former employers and invited back to RUNA to investigate some strange going ons. Mae, a Nordic caste member and a member of the Praetorian elite army of RUNA and Tessa, a young panama national who Justin gets into RUNA for a better education and chance of a better life. All these different view points can make the story confusing but in the long term it really does enhance the story. Richelle Mead goes into great detail in this book, this detail does enhance the readers understanding but also can get mentally draining and make it a very hard book to finish. The world is an amazing feat though. There is so much going on and in many aspects is fairly believable. Her introductions to the ideas of the Gods in this world and the “elect” they have chosen to serve their purpose is both impressive and comprehend-able, once you get past all the mad ramblings and talking crows. Yet the relationships are built up very well, whether familiar or romantic, Mead manages too spin her web around all of it. There are some basics that might help you reading this. 1. Know your different cultural Gods. This book is all about them, heck this whole series will be so to help aid your reading of this a basic knowledge of some gods will make a difference. And no, all that re-watching of “Thor” will not help you that much. 2. Stick with it. This book does get complex and confusing but is a rewarding read as you continue with it. 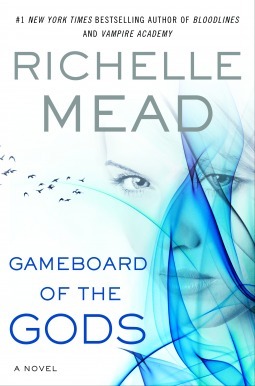 Richelle Mead does an extraordinary job at building her characters relationships and the world they live in. Like with any new series, there is a background you have to know to understand the mainframe of the society and how it works. 3. A re-reading of this book will make you understand alot more than in your first reading. Infact I highly recommend a re-reading before moving onto book two. Overall this book is vastly different from Mead’s previous works and the writing is, as ever amazing. However this book does have a strong sense of a world-building book, which is both a blessing and a curse for it. Many will struggle to read through it while others will appreciate all the background. As aforementioned a second reading would benefit the reader, and the second book, for me personally was an easier read. This book is a solid 3.5 Stars.